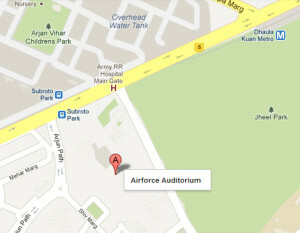 Airforce Auditorium is located at Subroto Park area of Dhaula Kuan in New Delhi. We are sharing the contact details of Airforce Auditorium which includes the office address, phone number, email ID with reference of various websites links. If you are searching for an auditorium, hall or theater to organise you event. Then you must check our list of auditoriums in Delhi. This auditorium also belongs to the same list. The sitting capacity of Airforce Auditorum is 686. This particular auditorium can be used for plays, concerts, shows, seminars, skits, competitions classes, theater programs etc. kind of events too. The charges to book the auditorium can get to know after talking to the official department of the auditorium only. These are the contact information which can help you or your guests to reach the auditorium without any kind of difficulty. It is the location route map of Airforce Auditorium. The nearby metro station is Dhaula Kumar which is approx. 1 kms away from the audi. Nearest bus stand is Subroto Park. You can check the Google map for better results. I want to book airforce auditorium place for wedding, for 650 persons. So waht are the booking fee and procedure . Please let me know. Sir I am Ex-JWO and I want to book the auditorium for marriage of my son on 10/11/2017 and 11/11/2017 for 300 and 500 persons respectively. Please let me know the availability and procedure. Looking for 200 person capacity auditorium for a dance recital on 1st April 2017 evening slot. Please revert back.